It seems to load fine for me, I understand why you are concerned. Would you mind sharing what browser you are using? Is it also possible to check the site in another browser or perhaps another computer? I'm sure we will figure this out. Thanks so much for your reply. It does work sometimes. Then other times, it won't load at all. I can try it 5 times in a row with nothing, then all the sudden it works. It seems to load consistently on my Android mobile, but I have had reports from 2 people using other computers that they couldn't access my site. I use Google Chrome, but I have tested in Opera, Internet Explorer and Safari. I have tested on both PC & Mac, too. I wonder if it's something to do with the DNS. I own the domain and have it with daily.co.uk I don't have Yola Silver. Am I right in thinking that Yola stopped allowing DNS access to non-Yola Silver users? Could that be why I'm having this problem? I am pretty sure it must have something to do with DNS stuff. I have a few Yola sites. A couple of them I just have external domains forwarded to Yola. Those work fine. The two sites I have the DNS pointing to Yola have the same problem at the same time. This must have something to do with it! If you pointed your domain before the new rule came into force into should be ok. I just did a DNS lookup on your domain and it appears to be setup correctly. All I can now suggest is to wait for a Yola Employee to come online and they will assist your further. I am sorry I couldn't be of more help. Thanks for the info about the new rule. I really appreciate you taking the time to respond. It means a lot! This seems to be intermittent as I have been able to see the error that you are seeing for a very short time, and then it goes back to your site. I have spoken with an engineer regarding this and from what we can see the DNS settings are as they should be. We have not had any other reports of this and are investigating from our end. Can you let us know in a few hours if you are still experiencing the same thing. Thanks for working with us no this. It's been 2 hours & as suspected, the problem still persists. Is it because I don't have Yola Silver? It seems to be working for me. Here's a screen shot. Please try clearing your browser's cache and see if that helps. Diane, I have tried that. In the earlier posts, I explained that I have tried it on several different browsers on 2 different computers & I've had reports from people who follow me on Twitter that it's not working. The problem is intermittent, so yes you will have seen the website. As I explained earlier, it works sometimes and other times it won't. This is hurting my business. I just spoke to a really great potential lead on the phone, but I don't want to follow up with an email, until I can get my website sorted. I want to get in touch with them today! Can you PLEASE PLEASE help me resolve this issue. I am thinking about scrapping the DNS & just forwarding the domain to my website. I really would prefer not to do that, but this problem could be losing me business. Please help! Hi I've been speaking to my Domain company. They've had a look, and he said it seems to be something wrong with the servers. Do you have clustered environment for your servers? 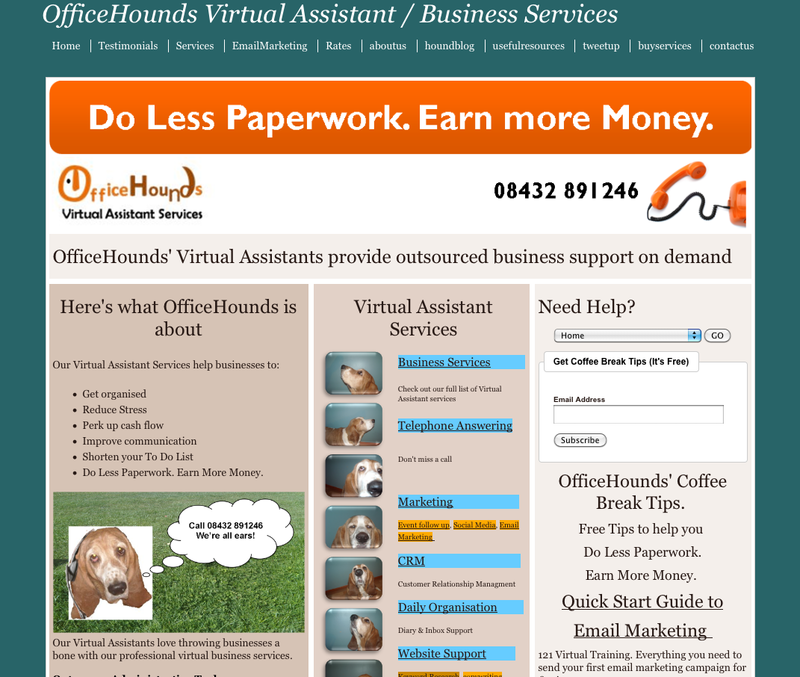 He explained that one of the servers may be accepting www.officehounds.co.uk and one officehounds.co.uk. if one server has different information, it could explain why it only works sometimes. Is that something anyone can check for me? For some reason. . .it seems to be working. I haven't noticed it dropping out, so I think it may be ok now. Hopefully, that's panic over. I'll let you know if I have any additional problems. Thank you for keeping us informed about this problem. We'll continue to look into it at our end. Please do continue to monitor it and do not hesitate to let us know if it was to arise again. Do you need to republish my site if I've done that? Can you please give it a try? I am gutted that my site still is not working! If you could promise me that buying Yola Silver would fix this, I would. I don't know what to do. I am not happy that my site is not available to potential customers. Can you please suggest a workaround or something that might help? Is there any Yola employee available who can try republishing my site? I understand your concern about your business, as you are dependent on your site being online. Our engineers and Emmy (who commented here too) are working on the problem and she will get back to you here or via email as soon as she has some feedback. I do understand this is frustrating. I have been working with an engineer on this and we have placed some checkpoints on our system looking for 503 errors so we can look at where this is happening. So far we are not finding any, but we truly do not doubt that you are seeing this, we are just having trouble replicating it and are receiving no other reports from other Yola users. I have again looked at your domain settings and your records are proper for both your domains, there is an A Record for the www and non-www version of your domain name so all appears to be well there. I am also able to visit your site successfully from here right now. Are you currently seeing this error message? Can you post on this thread as soon as you start seeing it consistently with one of your sites? Apologies for the delay in responding. It's evening here in the UK. The first time I logged in I had the same problem. 19:58 The attached screenshot was taken at 19:58. 20:04, I refreshed the screen. Still no website. 20:04Tried typing www.officehounds.co.uk. Still no website. This is what it does all of the time. 20:07 tried checking my buyengland.co.uk site (worked straight away.) Closed Officehounds tab. 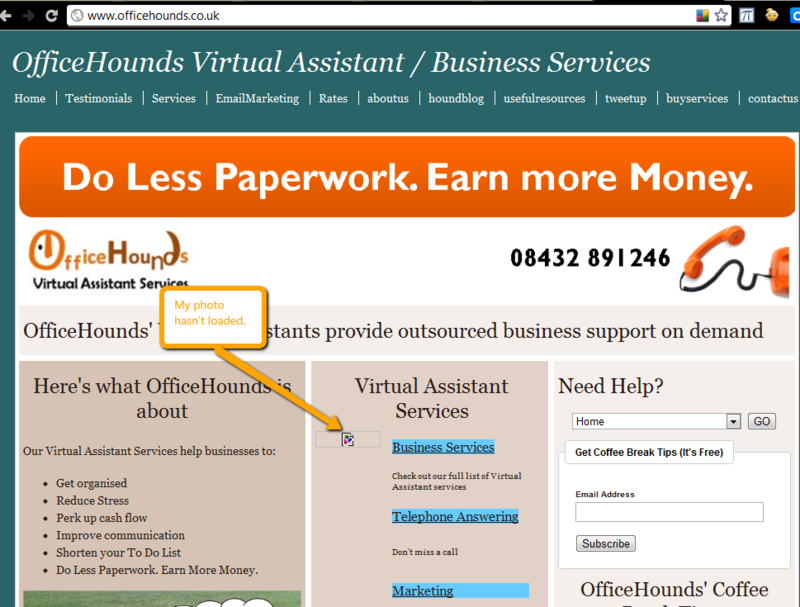 20:07 tried opening Officehounds.co.uk No website. 20:09 tried refreshing. It loaded straight away. Closed tab to test again. 20:10 tried opening www.officehounds.co.uk No webite. 20:11 Refreshed website. It was working. This is the exact thing I have been experiencing for days. I have tested it on different browsers & different computers. In the screenshot above, the photo didn't load. That's the first time I've seen that happen. When I refreshed the photo was there. Thanks for sharing the above information. Emmy is still working with our engineers in this regard. We greatly appreciate your patience as they continue looking into this. I will be referring your request to Emmy and she will update you as soon as she speaks further with the engineers. I thought I should let you know that I have encountered this problem (but thankfully only in a minor way) with my website too. I had assumed it was "just me" because my site only disappears for a few minutes and then reappears, and this only happens approx. once a week. All I see when this happens is a white screen. I did have someone tell me that they couldn't load my website, but assumed it was a problem from their end and didn't put the two together. This just happed again 11:52am NZ (daylight saving) time. I have my own URL, which I purchased from a different company. I have published under http://www.xtolz.com for about 18 months or more. I tried your website about 10 minutes ago, and I got the blank screen. I tried my website, and it didn't work either. I tried yours again & it worked but mine still isn't working. It's not just a problem with my website. I have tested Terry's website along with mine. I would really like to get this fixed before the Easter Weekend, business people will have some time off & might be looking for my services. I want to be pushing people to my website with Social Media, but I can't do that if my website is down! Will upgrading to Yola Silver make any difference? If it will resolve the problem, I'd rather do that than keep worrying about whether potential customers are getting a blank screen. I understand this is very frustrating. I have been working closely with one of our engineers on this issue and we have been monitoring our servers specifically for problems with your website and any error messages. We are not seeing anything on our side to be a problem. Since we started running the check on our side we have seen 276 hits to your site and no errors. I have been looking at your site consistently over the last 24 hours and it comes up every time for me. We are keeping the server log running to continue to monitor things but as of right now, we cannot find a problem on our side. 1. Try to access your site from a computer that is on another network and check it this way, as it is working as it should from here for me and my colleagues. 2. Contact your ISP and ask them if they are able to take a look at things on their side and see if there is any type of block on your ip address or if there are problems that they are noticing with other customers on their network. 3. Contact your domain registrar and ask them if they can review your domain settings and see if there is anything on their end that could be affecting the way your domain loads. I am sorry for how frustrating this is and we are doing our best to help solve it, we are just at a loss as to what the problem is right now as we cannot see anything and this report is the only report we have.